Recently released data by Standard and Poor’s (S&P) and Case-Shiller indicates that its measure of house prices, the House Price Index – National, rose by 5.6% on a year-over-year not seasonally adjusted basis. This is the 27th consecutive month of year-over-year increases in the house price index. Over this period of more than two years, house prices have risen by 20.7%. The S&P/Case-Shiller House Price Index is now at its April 2005 level. Similarly, the recent release by the Federal Housing Finance Agency (FHFA) indicates that its measure of house prices, House Price Index – Purchase Only, rose by 4.5% on a 12-month not seasonally adjusted basis in July 2014. This marks the 30th consecutive month of year-over-year growth. During this period, not seasonally adjusted house prices have risen by 21.0% and have returned to their September 2005 level. A previous post showed that recent house price appreciation was not matched by a recovery in the homeownership rate. Some evidence points to tight lending standards as a culprit behind households’ inability to purchase a home. But despite the higher barriers to obtaining mortgage financing, consumers appear to believe that it is a good time to buy a house. 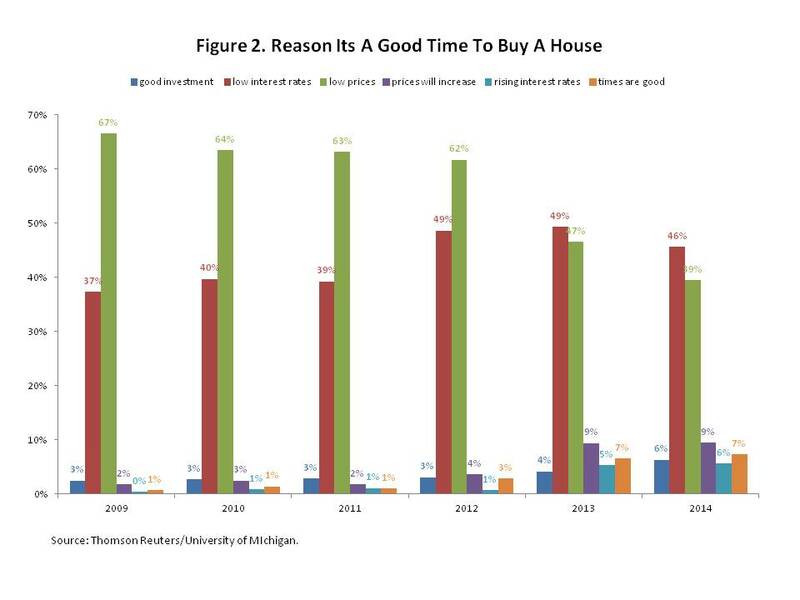 According to the Survey of Consumer Sentiment produced at the University of Michigan, a large net share of respondents currently believes that it is a good time to buy a house. 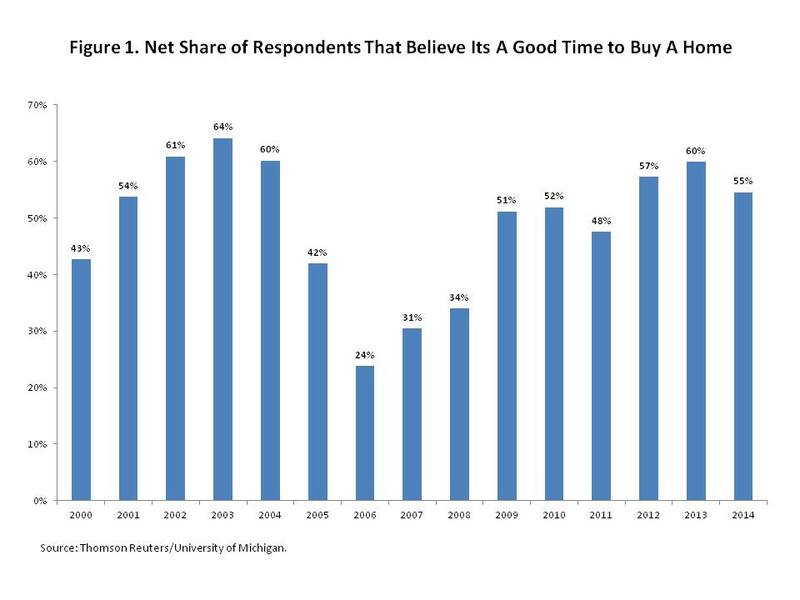 The net share represents the difference between the percent of respondents that believe it is a good time to buy a house and the share that does not believe that it is a good time to buy a house. According to Figure 1, a net of 55% of respondents believed it was a good time to buy a house through the first 9 months of 2014. Although the net share in 2014 is slightly down from the net share reported in 2013, it is still more than twice as high as the low reported in 2006. Except for 2011, the net share of respondents that believe it is a good time to buy a house has exceeded 50% since 2009. The main reasons consumers believe it is a good time to buy a house are low prices and low interest rates. However, the percent of consumers that believe that it’s a good time to buy a house because prices are low has steadily declined since 2009. In 2009, of the respondents that believed that it was a good time to buy a house, 67% thought that low house prices were one reason. By 2014, 39% of the respondents that believed that it was a good time to buy a house felt that low house prices were a reason. In contrast, of the respondents that believed that it was a good time to buy a house, 37% thought that low interest rates were a reason. By 2013, 49% of respondents that believed that it was a good time to buy a house, felt that low interest rates were a reason. The share that still believes that low interest rates are a reason to buy a house has dipped slightly over the first 3 quarters of 2014. Other reasons consumers mentioned, including good investment, future increases in prices, future rising of interest rates, and present times are good, have risen in recent years, but do not appear to be popular reasons to buy a house at this time. Let me help you with All of your Real Estate needs. Get into the market before the interest rates rise!